Here is a photo taken yesterday of a statue from our shrine of the Dharma-Lord Gampopa, whose life marks a great turning point in the Kagyu Lineage of Tibetan Buddhis, of which gratefully I am a member. 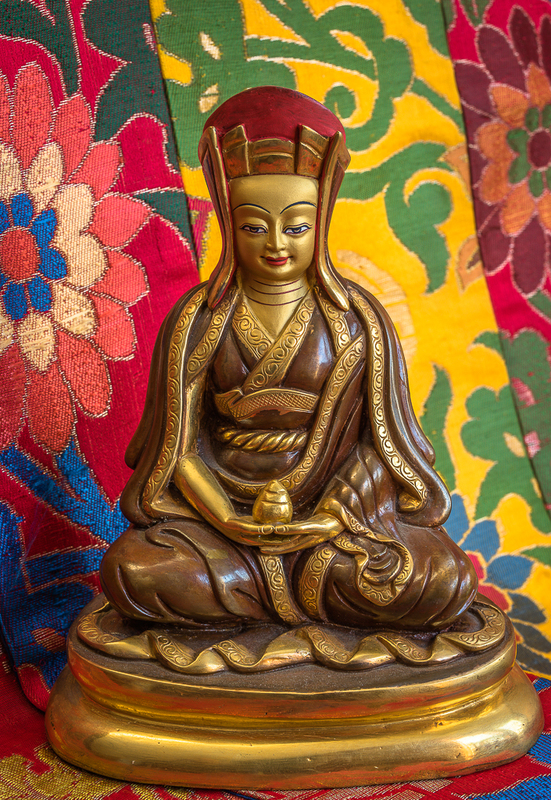 Gampopa was the principal student of the great Tibetan saint and yogi Milarepa. He in turn then taught the first Karmapa, Düsum Khyenpa, one of 17 lineage incarnations of the Gyalwang Karmapa. The Karmapa was the first reincarnated lama in Tibet. Like the Dalai Lama, the Karmapa represents an entire lineage. While the current Dalai Lama is the 14th incarnation in the Gelupa Lineage, the current Karmapa is the 17th incarnation in the Kagyu Lineage. The whole point of these lineages is to pass on the method for enlightenment of the historical Buddha, which is called “The Dharma.” And passing on does not mean just passing a book with the sacred writings, like a baton is passed in relay race. The teachings are said to be poured from one Karmapa into the main students in his retinue, who in turn realize them and after the Karmapa passes away, pour the teachings back into the young Karmapa when he is reborn. In order to pass the dharma on, these precious teachings have not only to be understood, word for word, they have to be realized in their entirety. Someone has to “get it.” That is what has to be communicated, the living fire of the teachings in full realization — no small task. This is what is called an “unbroken lineage,” not the parade of bodies itself, but the living flame that is transmitted, and the subsequent realization entailed. This lineage-idea was not so obvious to me in the beginning of my own practice of dharma. As I became more and more involved with the monastery I work with, as I got on more committees, and served on various advisory boards, as a fundraiser, etc., I felt it was my obligation to, of course, raise funds. There was an ashram just down the road that was doing really well financially. People poured in. At that place they apparently spent a lot of time on advertising, and so on. When I would bring up ideas of how to better attract attention to our monastery in board meeting, everyone would nod. However, for some reason there was no real fire in those nods. Not much changed. And so it took me some years to realize that money, even though we needed it, was not the main thing for these Tibetans. Not even near. They actually were concerned with perfecting the lineage, realizing the dharma in real-time, in living teachers. Not being realized myself, this was for me a hard sell, as in: I just didn’t understand it. I thought we should spend more time raising money, which we did, but very gradually. After many years I begin to actually understand exactly what I am telling you here, that unless the dharma is realized by someone, there can be no transmission of it. That is a scary thought for a beginner like me! Just as in the Olympics, an actual burning flame of dharma has to be passed from mouth to ear, from generation to generation. That’s lineage, at least in the Karma Kagyu lineage that I belong to. All eyes are on the realization. Raising money? Well, yes. Need to do that too, but not at the expense of not realizing the dharma, one individual at a time. Once I grasped this concept and begin to see it happening around me, I understood that realization isn’t just an option. It is essential-- the sine qua non of what lineage is all about. Without it, there is no lineage. Lineage (and its transmission is like that); it is either realized or it is no longer a lineage.